I find the most incredible things on del.icio.us :-) I am so going to do this with the kids! Kudos to Nina in Milano for sharing her lovely creation and how to re-create it at home. In Miss M’s classroom they’ve been making Journey Dolls this past month, and she’s been talking about them almost daily. The doll she’s making now is made from a retired sock and extra fabric. The plan is to hand the doll to someone who is leaving town along with a stack of pre-addressed post cards. That person will be instructed to give the doll to someone else who is going on a trip, and so on, and so on… Each person will be asked to send M a post-card. All of the kids in M’s class are making these dolls and they will be tracking where they all go from the classroom. I’m really looking forward to seeing her doll before it is sent on to roam the world. 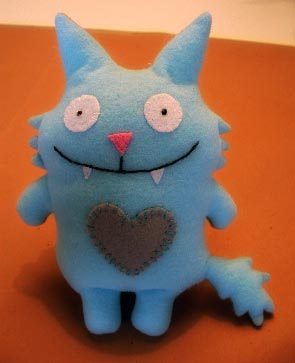 Anyway… this is my (very) round-about way of saying that I think this felty monster will be a fun project to do with M&B. PS… I have to be careful with my browsing time — from the instruction-set I landed on a Flickr pool chock full of these creatures, each more inventive and playful than the last. Am I the only person on Earth who’d never seen these before?? Thank you so much for sharing. I am just learning how to sew (with help from my Mom) and I am sure that my daughter, Mom and I would have fun making one of these. Thanks again! Glad you liked it, too! I’m a terible seamstress. Both my Mom and mother-in-law are pros with a needle, but I’ve got a long way to go. It’s good to know I’m not alone!